Neil Yound wrote Old Man for Louis Avila who was the caretaker of a ranch he’d bought. It was released on the great album Harvest. On the album he had James Taylor on backing vocals. Don’t you just want to know what was written on the side of his guitar (you see this at the end)? It’s an absolute classic for singing around a campfire with friends. Start off with very basic strumming. Notice that Neil has terrible left hand thumb position – but here it allows a particular ornament of the F chord. He does play the G chord the most sensible way. Most importantly he keeps his right hand strumming down and up the whole way through, nice and relaxed. The guitar work here is some good straight forward chords but with embellishments added, especially in the strummy bits. Much of the musicality of this performance relies on dynamics – loud and quiet playing and a variety of accents. This is just two verses and a chorus with some guitar strumming to move between those sections. Nice and simple. The numbers on the top row represent the beat of the bar. If the pattern is in quavers the you’ll see 1 + 2 + etc. If it’s in semiquavers then it’ll be 1 e + a. There are 4 beats to the bar. The beat is quite slow, which you can tell by watching Neil’s foot in the video. 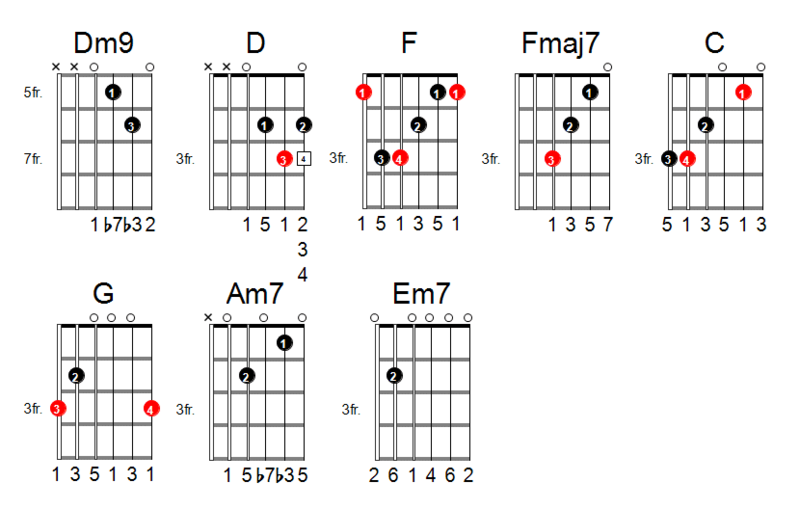 Here we’ve shown some ‘extended’ chord shapes. The symbols above the lyrics just say Dm, but you can use a Dm7 to make a richer sound. The same goes for the Gm. If you want a simpler style then just use normal minor shapes. We’ll be looking at some other possibilities in the lessons. Old man look at my life, I'm a lot like  you were. Love lost, such a cost, Give me things that don't get lost. Like a coin that won't get tossed  Rolling home to you. Ah,     one    look in my eyes and you can tell that's true. Lullabies, look in your eyes,   Run around the same old town. Doesn't mean that much to me   To mean that much to you. I've been first and last,      Look at how the time goes past. But I'm all alone at last. Rolling home to you.